Best vacuum to use without any wifi availability? The very latest news and updates for the iRobot Roomba robotic vacuum, the Scooba Robotic Washer and the Dirt Dog workshop sweeper. All discussion and troubleshooting questions go here. so i need to get two units for an elderly family house that has absolutely zero internet, wifi or cellular connection of any kind. I'd prefer to stick with iRobot or Neato. I've been going through loads of options and this is where I've come out. I'd really appreciate your opinions. - No wifi or internet connection means that you can't set a schedule and of course all the other floor mapping, charge & resume features etc won't work. Just a dumb clean. - Any model higher than an 886 lacks physical buttons and requires wifi / internet / app to set schedules etc..
what would you go for in this situation? input of any kind gratefully received! Re: Best vacuum to use without any wifi availability? assuming no lighthouses or virtual walls are used with the roombas (because old age prevents understanding them, apparently), and the robots are just allowed to roam free to do the best they can moving when bouncing from room to room, are there any real differences between the 860 / 870 / 800 models? I've read dozens of articles and some say the differences are mostly in bundled accessories and the room to room cleaning (when using lighthouses). Others say the cleaning from the 880 upwards is noticeably better while some say the units are all mechanically identical. It's hard to triangulate to a reliable opinion. All those 800 models use the same firmware. The different numbers are for providing different accessory packages. You might want to fall back to a very trusty Roomba called the Discovery Scheduler. Much earlier generation robot but very dependable. They will be much cheaper and might be available in your area. thanks vic. interesting, all the reviews i read say the 880 navigation and cleaning is far superior to the lower models. It just works, is quiet and easy to repair with limited mechanical skills. Customer Service is outstanding. thanks for the input. i ended up buying two brand new e5s (found a super-cheap deal so just had to) and also a bunch of 880s, as they can be scheduled with physical buttons and I really like the level of cleaning they do. I also picked up a 560 to tinker with and try and get it to act as a dirt dog for a courtyard / basements, as well as an actual dirt dog (shipping from the US which hopefully just needs a new battery from the description) and 2 x 650s for general use. Where does one find ‘a bunch of 880s’? babakonda wrote: Where does one find ‘a bunch of 880s’? lol, a mixture of ebay (uk & europe) and local classified sites (always really good bargains to be had on these, and almost no competition compared to ebay. e.g. great condition 880s for £100-£150.. 650s for £20-£50 etc.. It's mostly people who can't be bothered with the hassle of ebay and shipping etc, so as long as you can go and pick it up the bargains are great). I recently closed up my ebay account. Way too many problems over the years. You can also find used gear on Amazon. I see some 880s and 877s listed. I had my account since the early 2000s as well but didnt use it very often. Every transaction became a joke in my house because somethimg always went wrong every single time. The last straw was more of a paypal issue (i think) which lets face it, the 2 companies are kinda one in the same. I bought a $1300 subwoofer because i needed that model and ebay had the last one in existence. I signed up for paypal no interest for 6 months and they double billed me. They charged it to my paypal credit amd also to my checking account. $2600! Ebay blamed the seller, the seller blamed paypal, and paypal blamed ebay. Nobody would help me except Wells Fargo who eventually reversed the extra charge. It took a couple weeks to get my money back. So I paid off the 1300 i owed paypal and shut both accounts down. We only shop Amazon now. Its hassle free and they are so easy to work with. if you;re ok buying from another country try looking at italian & spanish classified sites. They often have loads more irobot stuff on sale than the uk (especially scoobas) and you can get some good deals if you're careful. I recently got a totally new and unused scooba 230 from spain for €90. Thanks a lot! Wonder how many of those would be willing to ship abroad. I guess I’ll find out. almost all of them. 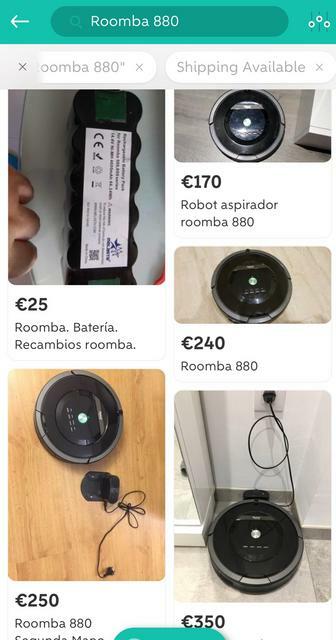 If you install the wallapop app you'll notice there's an option in the search filter marked "shipping available", so you can just look at those. For reference, I just bought a brand new 895 on wallapop (like, totally unused, still got the security seals unbroken) for €290 including tracked international shipping from spain. There are even cheaper ones if you don't might a used unit. Even with ‘shipping’ option selected, I don’t see any option to buy. Do I have to engage in chat with the seller first? Last edited by babakonda on February 7th, 2019, 6:45 am, edited 3 times in total.